Ka Tunying’s officially opened its 8th branch at SM North North Towers coinciding with its owner Anthony Taberna’s birthday on Jan. 16. 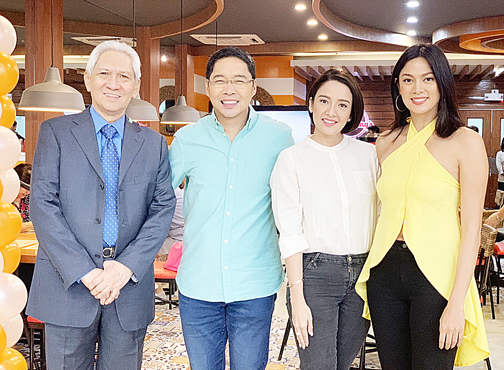 The event was witnessed by a few members of the entertainment press, celebrity guests Jon Lucas of Hashtags and Miss Universe 2013 3rd runner-up Ariella Arida, and Hon. Ombudsman Samuel Martires. The grand opening of the newest branch serves as the relaunch of Ka Tunying’s as a full service restaurant. Ka Tunying’s is now a casual hangout place and dining destination in one. It serves Filipino cuisine, traditional and home-cooked dishes and merienda, for local diners. Last year, Ka Tunying’s opened four new branches, three of which were Ka Tunying’s Juniors --the kiosk versions of the full service restaurant. They opened in Clark International Airport, NAIA Terminal 3 departure area’ one in Sta. Rosa Nueva Ecija, and finally at SM Megamall in Mandaluyong. Other than serving their best-selling “Pinoy silog” meals, the newest addition to the growing restaurant chain owned by the broadcast journalist, the SM North Towers branch will serve the latest addition to the menu including the Sinampalukang Manok, Crispy Kare-kare, Manok Ni Tunying, Crispy Pata and Tortang talong. Also part of their offerings is their merienda hit Tsamporado with tuyo and their flagship merienda meal, the famed Arroz Ala Tunying. Ka Tunying’s SM North Towers is located at the ground floor and is open daily from 7:00 am until 10:00 p.m.. For franchising and other inquiries call them at (02)366-1342 or follow them on their official Facebook page; @katunyingscafe and @katunyingscafe on Instagram for updates.